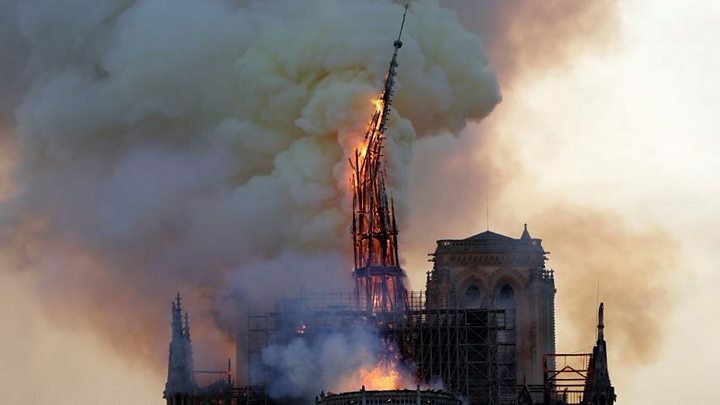 The spire of the 850-year-old building was completely destroyed in the blaze. 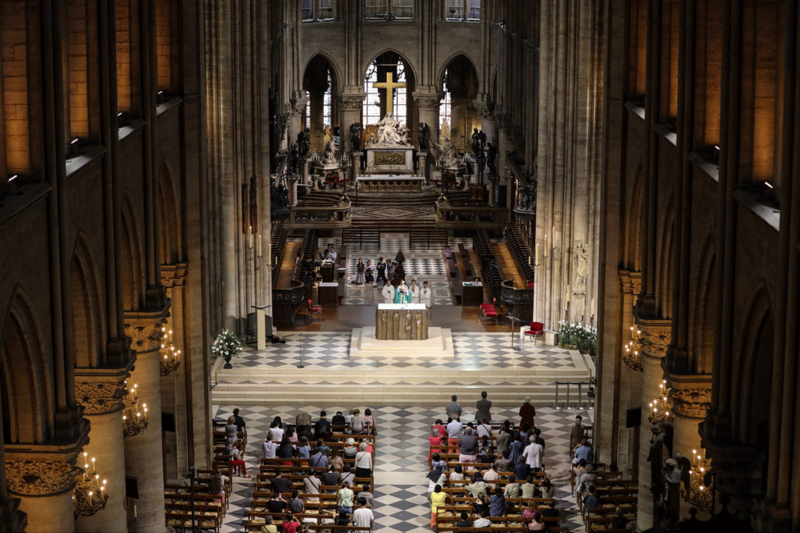 Meanwhile, cathedral bells across France rang out in solidarity with Notre-Dame on Wednesday. They sounded at 16:50 GMT to mark the exact moment when the blaze started on Monday. The entire cathedral was only minutes away from total destruction, officials have said. Could Assassin's Creed help rebuild Notre-Dame? President Emmanuel Macron vowed it would be rebuilt "even more beautifully", adding that he wanted the work done within five years - although experts warn its reconstruction could take decades. 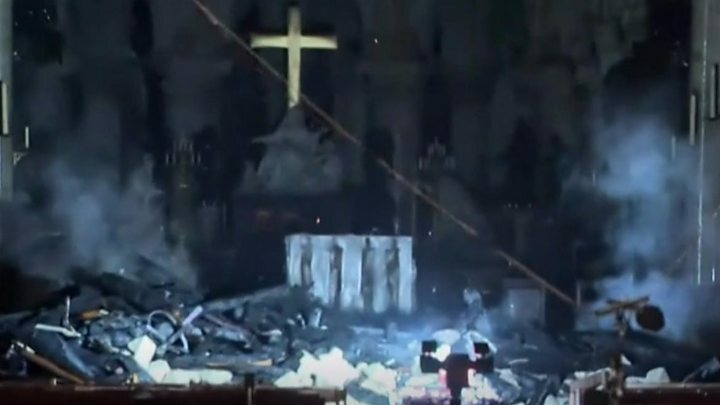 Meanwhile, a copper statue of a cockerel - a symbol of France - that topped the spire has been recovered from the rubble "battered but apparently restorable", the culture ministry said. The cockerel contains holy relics, but it is not yet clear if these are still intact. Jacques Chanut, president of the French Building Federation, tweeted a picture of the statue being carried by Philippe Villeneuve, the architect in charge of the repair project. On Wednesday, US President Donald Trump said he had spoken to Pope Francis and offered "the help of our great experts on renovation and construction" to rebuild the Roman Catholic cathedral. Correspondents say it is not yet clear if the Vatican will play any role in repairing the building. 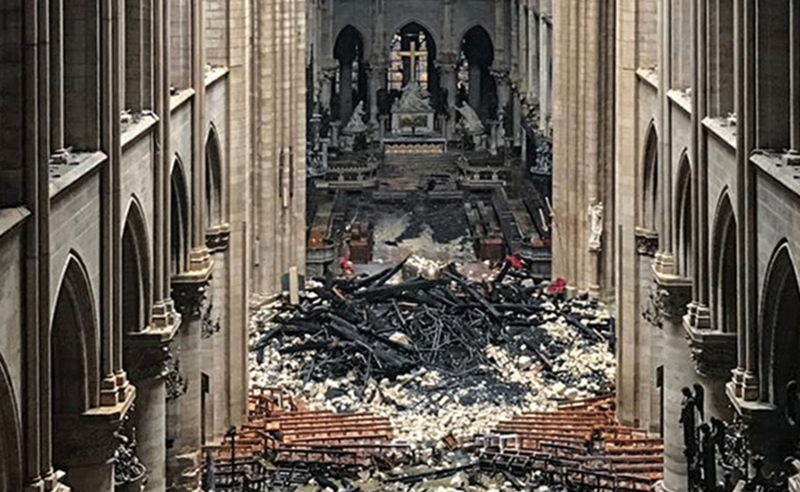 The blaze, which began on Monday evening and was not fully extinguished until almost 15 hours later, destroyed most of the cathedral's roof and led to the collapse of its famous spire. Deputy Interior Minister Laurent Nuñez said the structure was in good condition "overall" but that "some vulnerabilities" had been found in the stone vaults and the remainder of the ceiling. Work to remove the cathedral's paintings will begin on Friday, Mr Riester said.